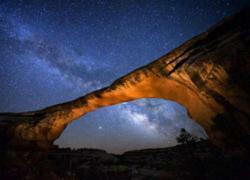 Utah's Canyon Country, in the four corners of the US, is one of the best areas in North American for sky watchers. It will also provide an excellent location for watching the Annular or "Ring of Fire" Eclipse on May 20, 2012. The dark skies in this area are a significant natural resource. --Gordon Gower, Natural Bridges Park Ranger. Utah’s Canyon Country, one of the darkest places in North America, offers some of the best eclipse viewing areas for the rare May 20, 2012 Annular, or “ring of fire,” eclipse. The partial eclipse for this area begins at about 6:20 pm Mountain Standard Time and ends at 8 pm, while the annular eclipse (in which the moon lines up directly in front of the sun except for the outer edge of the sun) happens at about 7:30pm, lasting for more than two minutes. Special events at both the Natural Bridges National Park and on the San Juan River are available. Natural Bridges National Monument, located near Blanding, Utah, was named the World’s First International Dark-Sky Park in 2007 by the International Dark-Sky Association, and offers astronomy programs from May through September each year that include a ranger talk at dusk, a laser tour of the sky and a telescope tour of the sky two nights per week. The new moon of the eclipse will make the night sky even darker than usual on May 20, allowing the best viewing of celestial bodies that evening. “The dark skies in this area are a significant natural resource,” said Gordon Gower, Natural Bridges Park Ranger. Gower says Natural Bridges will be one of many locations in San Juan County with excellent eclipse viewing, followed by star-gazing and locating nebula, supernovas, star clusters and far off galaxies. Wild River Expeditions, the river outfitter located in Bluff near monument valley, is offering a three-day, two-night rafting trip specially designed to view the eclipse from a short hike off the San Juan River. Utah’s Canyon Country—rich with dense archeological evidence of ancestral Puebloan civilization—is dotted with national parks and monuments that provide access to the numerous natural wonders of its Colorado Plateau, including Monument Valley, Canyonlands, Goosenecks State Park, Rainbow Bridge National Monument, Valley of the Gods, Edge of the Cedars, Hovenweep and Natural Bridges. During the 21st century, there will be 72 annular eclipses. The May 20, 2012 annual eclipse will be the only one of these 72 for which one of the optimal viewing locations in North America includes Utah’s Canyon County. This will be the first annular eclipse in the United States in almost 18 years. Located in the Four Corners region of the southwest United States, Utah’s Canyon County is the heart of the Colorado Plateau with the textbook geology that created its breathtaking canyons and majestic mountains. San Juan County provides a perfect, centralized base of travel to the world-renowned features that surround us. 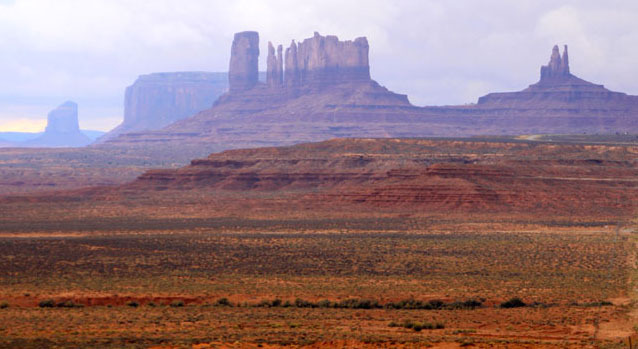 National Parks and Monuments, including Monument Valley, Canyonlands, Arches, Lake Powell, Natural Bridges, Hovenweep, Rainbow Bridge, Dead Horse Point and Mesa Verde are all within Canyon Country or easy driving distance. State parks include Edge of the Cedars Museum and the great Goosenecks of the San Juan River. All of this and more is easily visited from our excellent selection of motels, lodges, RV parks, campgrounds, and resorts. Fine dining as well as family restaurants complement the visitor experience.